Placed over CCNF Man in Black!!! West Coast black and grey genetics have made their way to Michigan!! We have been lucky enough to acquire this solid male whose pedigree is full of high quality black and grey genetics. PPeruvian Felix, Aussie Rockford, High Point Touchstone, Danko and even Peruvian Bueno to name a few. Lily had a difficult birth and thus will no longer be a part of our breeding program. She is very sweet and has lovely white fleece with a great staple length. She will make a wonderful companion/fiber girl. 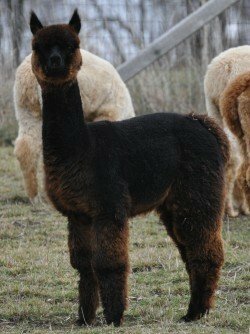 She will be available when her cria is weaned. What a beautiful true black female this girl is. 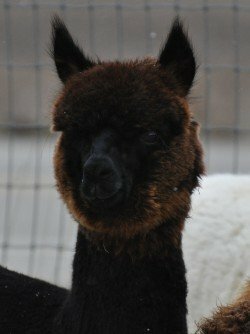 Mazie is full of crimp, has bright fleece and tons of black and grey in her background. She is also nicely built with a square frame, large bone for a female and coverage all day long. She has a very square conformation and a very pleasing personality. Auction sales are cash sales unless otherwise noted or agreed upon. 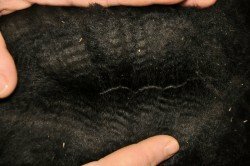 Board covered for 14 days after auction sale. Other terms may apply. Please inquire with any questions. Black Dam, National CH Grey Sire!